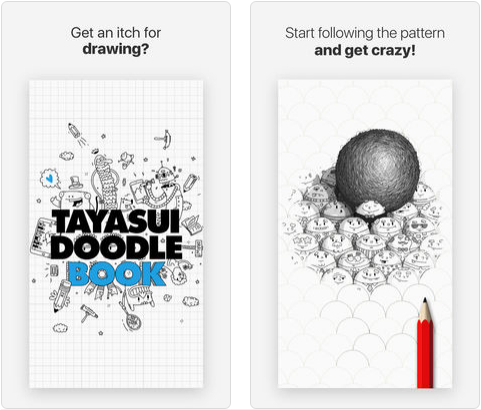 It’s easy to make sketch or doodle using Tayasui Doodle Book, Just want to doodle like crazy, and no pen and paper in sight?! Here comes Doodle Book! Ease your itch with its dozens of original patterns and smart tools (with optional soothing sounds), and doodle like there’s no tomorrow or draw with no fear of the daunting blank page! Open the app and choose a pattern that suits your mood. And just doodle carelessly, improvise a collection of bearmojis, make fish and sweets rain altogether… Or free your drawing spirit and let your imagination run wild: festive crowd, glorious architecture, futuristic microcosm… there’s no limit! Extravagant doodling or intricate masterpiece, enjoy a moment of pure relaxation or intense creativity!